Abstract: Pertya Sch. Bip. (Asteraceae: Pertyoideae: Pertyeae) is an Asiatic genus, ranging from Afghanistan to Japan. Pertya comprises 22 species of small shrubs: 16 species are endemic to China, one to Japan, one to China and Japan, one to Thailand, one to Taiwan, one to Afghanistan, and one to Afghanistan and Pakistan. It is characterized by having macroblasts and brachyblasts bearing alternate and congested leaves, respectively. 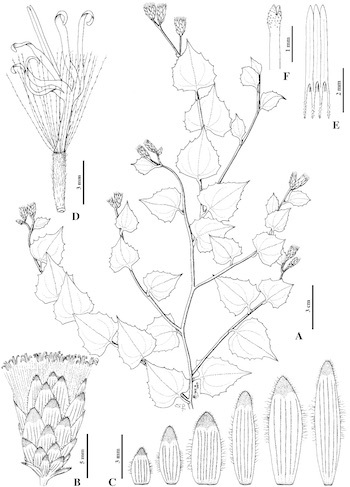 Pertya yakushimensis is synonymized with P. glabrescens. One new combination is proposed: Pertya dioica (Bunge) S. E. Freire. Three series previously recognized are raised to sectional rank: Pertya sect. Pertya, P. sect. Phylicoides, and P. sect. Sinensis. Pertya sect. Eupertya ser. Paniculatae is newly synonymized with Pertya sect. Phylicoides. The cladistic relationships of the genus, based on analysis of 36 morphological characters, were investigated. Catamixis, Ainsliaea, Macroclinidium, and Myripnois, the genera closest to Pertya, were included as part of the in-group, and Oldenburgia, from South Africa, was used as the out-group for phylogenetic analysis. Pertya is distinguished from Ainsliaea by its barbellate pappus setae (vs. plumose in Ainsliaea), and from Macroclinidium and Catamixis principally by its heterothalamic habit (vs. homothalamic in Macroclinidium and Catamixis). The phylogenetic analysis resulted in seven most parsimonious trees (MPTs), each of 111 steps. The genus Pertya, as currently recognized, is shown to be paraphyletic. However, if the monotypic genus Myripnois is included, Pertya is monophyletic. Cladistic analysis supports the reduction of the genus Myripnois into the synonymy of Pertya. The cladistic relationships within Pertya are consistent with the three sections proposed here: Pertya, Phylicoides, and Sinensis. A key to the species of the genus is provided, as well as morphological descriptions, illustrations, and distribution maps.